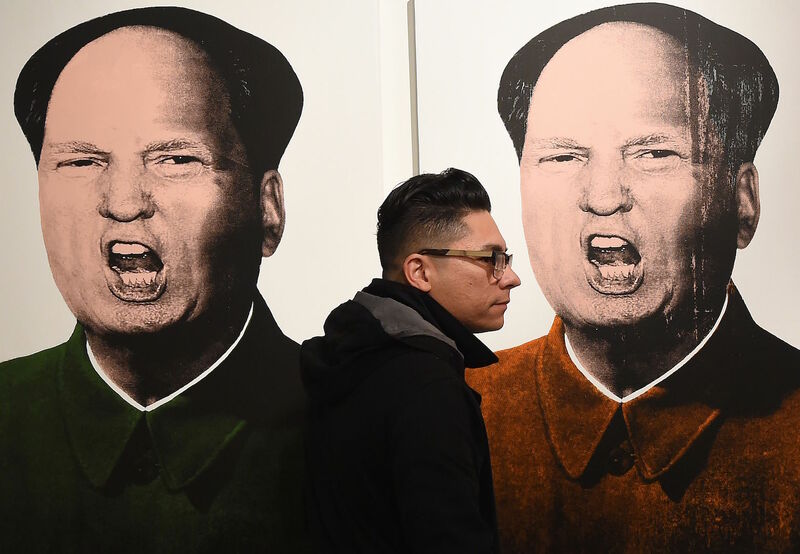 ‘Mao Trump’ images, by contemporary pop artist Knowledge Bennett, viewed by a visitor to the Ren Gallery in Los Angeles, January 31, 2016. In 1966, Mao observed that his personality was a mixture of contradictory elements. There was the self-assured sense of destiny and confidence that led him to challenge and overturn earlier leaders of the Communist Party, confront Chiang Kai-shek, and lead the Chinese revolution. This was, he said, an expression of his “Tiger Spirit,” something that was in constant interplay with his “Monkey Spirit,” one that was skittish, paranoid, and unpredictable.1 The Monkey was always ready to take on the Tiger with devilish glee. In the last two decades of his life, Mao’s China reflected this deep-seated contradiction as the country lurched between authoritarian control and anarchic confusion. What for the Great Helmsman was his life force writ large would rend the fabric of the society he ruled and threatened everything he had worked to achieve. Gangs of Four: Mao’s inner circle was the infamous Gang of Four. Donald Trump has his own Gang of Four: the canny female enabler, Ivanka Trump; the “Dog-head General,” Steve Bannon, formerly of Breitbart News; the loyal propagandist Kellyanne Conway, a genius at dialectical argumentation; and the helicoptered-in successor-in-waiting, Jared Kushner.3 When the farrago of Trump’s rule comes to an end, will they too end up in the dock like the original Gang of Four, or will they, like most things in America—homeland of the makeover and comeback—merely march forward, from victory to victory? First, Trump’s Great Leap Forward-style declaration of his net worth was a validation of Mao Zedong’s dictum “seek truth from facts.” In so doing, and by “telling it like it really is,” Trump flew in the face of U.S. political wisdom and reached out directly to the broad masses of people, overturning years of oppressive political correctness in the process. And, finally, it is Trump’s own financial independence and self-sufficiency that have allowed him to ignore major political donors and the Washington money machine, relying instead on his personal fortune. The article ends with a quotation from Mao Zedong’s famous parable about the “Foolish Old Man Who Moved the Mountain,” suggesting that Trumpism can achieve its aims not only through the efforts of Trump himself, but by future generations of his family. At this point in the article, the author inserts a picture of a bikini-wearing, oiled up, and glistening Ivanka Trump from a Harper’s Bazaar cover. He finishes his argument by making a plea to the new president: on his first official visit to China, he should bring his children with him. On April 1, 1969, April Fool’s Day, the Chinese Communist Party convened its Ninth Party Congress and declared that the Cultural Revolution had come to a victorious end. In reality, the rule of Mao’s radicals extended beyond both his death in September 1976, and the arrest of the Gang of Four the following month. It was only with the Third Plenum of the Eleventh Party Congress in December 1978 that the policies of the Mao era were repudiated, even though his shade would linger far into the future.4 It is hard to say how long Trump’s presidency will last, but there is little doubt that its effects will also long outlive him. The Chinese had to wait for biological attrition to resolve the problem of Chairman Mao, and still his waxen corpse lies in the heart of Tiananmen Square. We are already led to speculate whether, “after one hundred years,” as the Chinese euphemistically call death, the embalmed body of Trump, that Tangerine Caligula, hair in a preternatural combover, will be put on display in his New York faux-Louis-XIV penthouse or at Mar-a-Lago, Trump’s “Mediterranean-style” resort in Florida? For long years, America’s Republicans have worked to make their nation ungovernable, and through their actions they have given proof to the lie that government is always inefficient, interfering, and incompetent. Along with a media long ago identified by Neil Postman as one that aims to amuse us to death, they have generated distrust in government and the public good for rank political advantage. As we noted in the above, the advent of Donald Trump as U.S. president confronts China’s party-state bureaucrats with an erratic and capricious leader of a kind they haven’t had to deal with since Mao died 40 years ago. Trump’s presidency may give them an opportunity to show that they can be the more mature and stable partner in the Sino-U.S. relationship. However, given the leaden responses China’s party-state leaders offer in times of crisis and chaos in China, let alone internationally, there is little reason to believe that while they might be quick to demonstrate a preening and boastful Tiger Spirit in denouncing President Trump, they may easily be wrong-footed by that devil-may-care Monkey. For popular Chinese commentators and the nation’s cynics—furious men and women cowed and domesticated by a paternalistic system that at every turn reinforces their political impotence—Trump’s victory is a boon, a new source for anti-U.S. schadenfreude. It offers further evidence of the bankruptcy of Western-style politics and proof that we are in an era of illiberal democracy, one in which China’s sham multi-party system and farrago about basic human rights are trumpeted by the official media and the bullish propagandists at The Global Times. In the U.S.A., the escalating clamor of factional politics and media hysteria may well, as it has so often in the history of China over the last century, marginalize and suppress moderate, considered opinion. This will only further humanity’s move towards a new “age of extremes.” This will inescapably require us all to confront an unfinished 20th century.